For the first time in nearly a year, the Islamic State has released an audio message from its leader, Abu Bakr al Baghdadi. The audio file was released online late yesterday by Al Furqan Establishment for Media Production, one of the group’s media arms. The speech is titled, “This is What Allah and His Messenger Had Promised Us.” Baghdadi last addressed the public in December 2015. The so-called caliphate is under siege from all sides. But Baghdadi refuses to blow the horn of retreat, telling his followers that they are waging a “grand jihad” against all of their many enemies. Speaking in Manichean terms, Baghdadi advises his men that they should not allow Satan to convince them to “retreat.” Instead, the jihadists should remain at their assigned “outposts” and hope to “persevere” in the fight ahead. 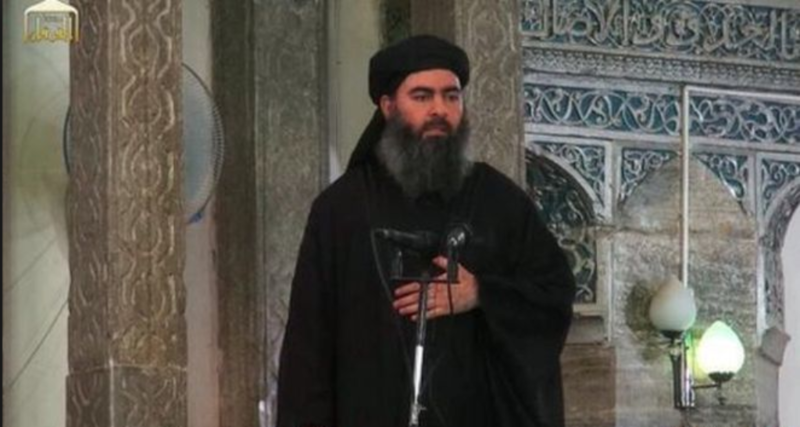 It is “one thousand times better” to remain “in your land” than to retreat “in humiliation,” Baghdadi says. But the jihadists’ reward may not come in this life. Baghdadi tells his people that they fight to avoid “hellfire” and can hope to achieve “paradise.” But the caliphate’s foes cannot hope for the same, Baghdadi claims, as hell awaits them. The Islamic State leader portrays the conflict in Iraq as a sectarian conspiracy against Sunnis. Baghdadi claims that various parties fight under the “pretext of waging war” against his group, but they are really only interested in killing Sunni men and then taking both their women and children prisoner. He alleges that the cities of Iraq are being emptied of Sunnis as part of a Shiite, or Iranian, plan. Still, Baghdadi’s message hints at the frustration he must have for the Sunnis in Iraq who are not rallying the caliphate’s cause. At one point, the Islamic State’s top man even compares Sunni Iraqis to the people of Israel, implying that they have not stayed on the true path. According to Baghdadi, the apostates, atheists, Christians, Jews, Shiites and other infidels have conspired to launch an offensive in Wilayah Nineveh (Province of Nineveh), which is the home of Mosul. But the jihadists should “remain patient” and guard against weakness, he says. Baghdadi uses this same sectarian framing to discuss the battles being waged outside of Iraq. But he cannot endorse his Sunni jihadi rivals. He even takes a swipe at the groups fighting against Bashar al Assad’s regime in Aleppo. The anti-Assad forces in Aleppo include jihadist organizations that are part of al Qaeda’s network, such as Jabhat Fath al Sham (JFS). Even though they are fighting Assad and his allies, Baghdadi refers to them as “apostate factions” and decries their supposed “treachery.” This is not surprising as JFS is led by Baghdadi’s former lieutenant, Abu Muhammad al Julani, and the rivalry between the two men has helped fuel the animosity between the Islamic State and al Qaeda. Despite Baghdadi’s disdain for JFS and its allies, he warns of the “vicious” campaign being waged by the “Nusayri” regime (meaning Assad’s government), as well as Assad’s Iranian, Russian and “infidel” allies. Baghdadi says they hope to establish a new “Nusayri” presence in Aleppo that ends the “rule of Allah” in the land, meaning rule according to Sunni Islamic traditions. The Islamic State has been deliberately ambiguous about its responsibility for some high-profile terrorist attacks in Turkey that it has been suspected of carrying out. But Baghdadi makes a clear call for operations against Turkey in his speech. Earlier this year, Turkey launched operation Euphrates Shield, which has successfully claimed territory from the caliphate in northern Syria. Baghdadi claims that Turkey has revealed its true agenda by entering the war. He argues that the Turks have taken advantage of the fact that the Islamic State has been distracted by the “war against the infidel nations” and has been forced to defend its territory. For these reasons, the so-called Caliph tells his followers to “attack” Turkey and bring the country into their “conflict.” Baghdadi also likens “infidel” Turkish soldiers to dogs and calls on the caliphate’s “soldiers” to spill their blood. Baghdadi addresses the caliphate’s “soldiers” far outside of Iraq and Syria. He specifically names Algeria, the Arabian Peninsula (meaning Saudi Arabia), Bangladesh, the Caucasus, Egypt, Indonesia, the Khorasan region (which includes Afghanistan and Pakistan), Libya, the Philippines, the Sinai, Somalia, Tunisia, West Africa and Yemen. The Islamic State’s loyalists operate in each of these areas, sometimes under the banner of official “provinces” for the group. Baghdadi says they have enraged the infidel nations, just as the formation of the caliphate did. And he praises their supposed “unity.” They should not worry about losing their leaders, Baghdadi advises, because Allah will provide them with new ones who are just as capable, if not more so. The jihadists in Saudi Arabia should continue their attacks against the Saudi government and its allies inside the country, Baghdadi says, because the Saudis have participated in the war against Sunnis in Iraq and the Levant. He also blasts the Saudis for allegedly seeking to “secularize” their country. Baghdadi singles out the jihadists fighting in Sirte, Libya for special praise, saying their fierce fight has foiled the designs of the European “Crusaders.” The Islamic State has lost much ground in Sirte since May, but Baghdadi urges his men to man their posts because their enemies could break. However, while Western-backed Libyan forces have suffered thousands of casualties during the offensive against the stronghold in Sirte, Baghdadi’s loyalists are not close to achieving victory. The Islamic State has repeatedly called on its followers to migrate to the lands of the caliphate. But if they cannot make it to Iraq and Syria, then they can join the jihad anywhere the group’s wilayah, or provinces, operate. Baghdadi repeats this call, saying new recruits have a “wide path” for migration. Toward the end of his speech, Baghdadi honors the top Islamic State officials who have been killed in recent months, including Abu Muhammad al Adnani and Abu Muhammad al Furqan, both of whom served multiple roles. Baghdadi says their deaths will not end the Islamic State’s jihad, but were instead necessary “sacrifices” and the “martyrdom” of top commanders only serves Allah’s will. Abu Bakr al Baghdadi does not sound triumphant in his new message, but he insists that the Islamic State will not stop fighting any time soon. And on that point, he’s right, they will not stop fighting any time soon. IS still controls large swaths of territory, they still have funds and fighters and weapons coming in. Yes, the loss of Mosul will be bad for them, as have been other losses as well, BUT, they have seen this coming for a long, long time. They have made the preparations that their leadership has deemed necessary long before now, I’m sure. These guys are not stupid. They are not weak. They are not going to just give up. Evil? Yes. Sadistic? Absolutely. Stupid? Not so much. They are well trained, well equipped, and highly motivated. My best guess is that they will fight, and claw, for every inch of Mosul, and the IA, the Shiite militias and the Kurds will pay a heavy price to retake Mosul.